I imagine most folks over thirty would be familiar with paper dolls. Reasonably cheap and easy to acquire, these classic toys entertained children long before there were Talking Tom plush toys or Angry Birds apps. For parents who are sad that their children missed the joy of playing with paper dolls, do not fret. Now, there is Mary Engelbreit's Paper Doll Dress-Up: “Breitville”. Created by illustrator Mary Engelbreit with Auryn Apps, Breitville transforms the classic game into a fun and interactive app. Upon opening the app the first time, you will be greeted by an introduction video by Engelbreit explaining her love for paper dolls and the reasons she wanted to create Breitville. Watching the video is completely optional; you can come back to it later from the Settings menu. 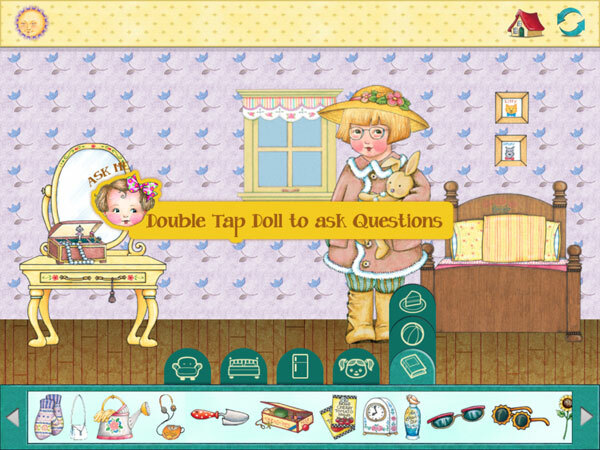 To start creating a doll, tap on the house marked with “Dolls” in the middle of the Home screen. You get a choice of five dolls: two girls, two boys, and a baby. Each doll comes with its own selection of outfits and hats. When you are happy with your selected doll, you can name it. Then, finalize your creation by dragging a small heart onto its chest to “bring it to life”. Back at the Home screen, you can set up a doll house with a garden, play at the park, or hang out at the beach. 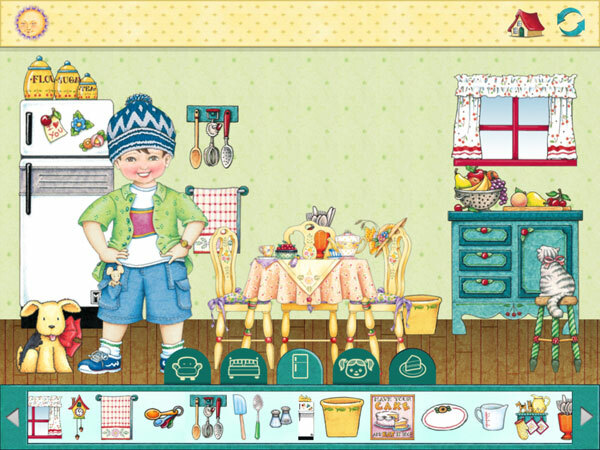 The app includes hundreds of items that you can use to decorate each place. Wherever you choose to go, you can place your doll anywhere you like on the scene. An interesting feature is the ability to talk to your doll by double tapping on it and asking questions like "Would you like to play?" or "Are you ready for bed?" Do note that this feature requires you to actually speak into the device's microphone. The doll will provide an appropriate response when it hears your question. Finally, you can also record a show with your dolls by visiting the TV Station. Choose a background, and add the dolls you want to play with. Then tap the red record button and move the dolls around like in a puppet show. As you record, you can also drag new dolls and new backgrounds onto the screen. To save your work, simply hit the record button once more and name the recording. You can then create a new recording by tapping the green button, or watch your previous videos by tapping on the Clapper icon. Designed to recreate a toy, Breitville is a frustration-free app that is great for kids. The app has no rules and no timer, so juniors can play for as long as you want. Using the app, parents can encourage juniors to tell stories. One thing that parents should note is that the app contains plenty of written instructions to help juniors use the app. This is great for older kids, but parents may need to accompany younger juniors who are not yet able to read. As someone who collected paper dolls when I was little, I think that Breitville is a great idea. What I like best about the app is that it cleverly takes a classic toy and enhances it by bringing technology into the equation. First of all, the app is very interactive. There are lots of things to do and see, so it is never boring. My favorite feature, besides being able to decorate the rooms, is being able to speak to the dolls. I imagine many kids speak to their dolls every day, so it is great that Breitville gives the dolls the ability to talk back. I am not sure what technology the developers use for recognizing speeches, but I think it is pretty good. I tested it out several times, and the dolls could understand my questions most of the time. I also adore the little details in the app; for example, as you tilt the iPad the Home screen also adjusts its perspective, giving a sense of realism to the app. There is also the “secret” feature like the plantable garden besides each doll house. If I could make a suggestion, I do feel that although there are plenty of items included in the app, more variations would be welcome. Similarly, I would also love to see more outfits for the dolls. But other than that, Breitville is a terrific app. In a world where everything is digital, sometimes it is nice to find a splash of nostalgia. I think “Breitville” by Auryn Apps did a great job recreating a paper doll world as an iPad app that both young and old audiences will enjoy. I would highly recommend it. Puppet Pals 2. Direct your own animated stories using talking virtual puppets. Sofia the First: Story Theater. Disney's latest princess tale, complete with its own virtual theater.